BAGHDAD — With Iraq’s short election campaign already under way, eight candidates met in a hotel conference room the other day for a late primer on something that is still a novelty here: getting themselves elected. “Even if you’re well known, you have to campaign,” the instructor began in an introductory course intended to teach what many Americans begin to learn as schoolchildren in their first vote for class president. She went on to caution them about what many of those same Americans often forget by the time they enter professional politics. The candidates – six men, two women – belong to an electoral coalition called Iraqi Unity, one of the major blocs competing for seats in the country’s new Parliament on March 7. The course is run by the International Republican Institute, which with its sister organization, the National Democratic Institute, has promoted democracy around the world for years and in Iraq since 2003. 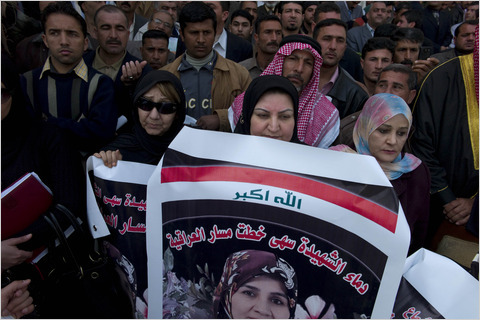 Iraq’s election is widely seen as a measure of the country’s progress toward democratic government. It’s a high-stakes, high-power contest between the big coalitions that will decide whether Nuri Kamal al-Maliki wins enough seats to return as prime minister. The conduct of the campaign thus far has raised some doubts about the country’s democratization, but this small conference room with Arabesque moldings and tapestries of stylized women is where the grassroots of democracy are. These candidates may not win – in fact, they probably won’t – but their embrace of the fundamental promise of representative government is sincere to the point of poignancy. Karim Radhi al-Khafaji lifted his sleeve and unbuttoned his shirt to show the horrific scars he bears from an explosion in a market in 2006. He limps badly. He’s the head of an organization that advocates for those the war has left wounded. “I consider myself the candidate for the disabled and the deprived and those who are marginalized,” he said during a break for tea. He said 15 percent of Iraqis suffer handicaps – grievous injuries, missing limbs – compared with a world average of 2 percent, and yet they have no elected voice. The course teaches the “T4 campaign system.” In English the T’s are target, touch, track and turnout, a step-by-step plan for winning over voters. In Arabic, the words were changed slightly to preserve some of the alliteration: istehdaf, etisal, mutaba’a, tahfiz. The instructor, an Iraqi who asked that she not be identified because of fear for her safety, went through the basics of direct contact (door-to-door campaigning, text messaging, e-mail) and indirect contact (the campaign posters that festoon most of the country’s walls and streetlights at this point or television ads, which are beyond these candidates’ means). To get elected, she explained, you don’t have to win over every voter. You have to focus on a core base, as well as those who might be inclined to vote for you once they know you. You have to tailor a message differently for Baghdad, say, than for Basra, depending on the issues important to voters in each place. It’s not enough to promise better health care. You have to focus “sub-issues” that are concrete: how to acquire better equipment and more medicines. Most important, you have to follow up with those you meet. “Every party needs a database,” she said. These are ideals. The candidates wrestled with realities. Obaid Agab Ahmed, an engineer educated in the former Yugoslavia, complained about what he called in Arabic, literally, “counter-corruption.” To translate: mudslinging, dirty tricks, going negative. “When you run as a candidate, you should expect this,” interjected Ghassan Jawad Kadhum, the International Republican Institute’s program officer. The institute has conducted 127 courses since October with 2,737 participants – amounting to 40 percent of the registered candidates. They’ve included candidates from all parties, including those with explicitly anti-American campaign rhetoric, which in an Iraqi election campaign means most of them. Mr. Kadhum, the program officer, was dressed dapperly. He has an infectious smile, an acute political mind and the polished manner of a candidate himself. In fact, he said, he might just seek office one day. For now, he is content to groom others. The richer candidates hand out cash and blankets, several complained, speaking over each other at times. “The same people harmed by him are voting for him because he’s buying their souls,” Mr. Ahmed said, referring to one of the country’s two vice presidents, though he didn’t specify which. Sabieh Jabur al-Kaabi pointed that campaign posters are being torn down, though not of those of the top candidates — that is, those with influence and power.